Bees live in highly stratified yet flexible social organizations with group decision-making skills that rival academic, corporate or government committees in efficiency. In spring, when bees swarm, they choose a new hive that needs to satisfy many demands within a couple of days (consider that the next time you go house hunting). They communicate information about the location and quality of food sources using the waggle dance. Bees can fly several kilometers and return to their hive, a remarkable navigational performance. Their brains seem to have incorporated a map of their environment. And a scent blown into the hive can trigger a return to the site where the bee previously encountered this odor. This type of associative memory was famously described by French novelist Marcel Proust in À la Recherche du Temps Perdu. Given all of this ability, why does almost everybody instinctively reject the idea that bees or other insects might be conscious? The trouble is that bees are so different from us and our ilk that our insights fail us. But just because they are small and live in colonies does not mean that they can’t have subjective states, that they can’t smell the fragrance of the golden nectar or experience the warm rays of the sun or maybe even have a primitive sense of self. I am not a mystic. I am not arguing for pan-psychism, for the notion that anything is conscious. Nor am I assuming that bees can reason or can reflect on their fate as animated cartoon bees. The definition of educational technology is new. While it grows out of and uses concepts from previous theoretical frameworks of educational technology, it is, in Lewis’ (Hawkridge, 1976) words, “a whole new conceptual frame work.” It is a synthesis which presents a new way of thinking about what the concept, field, and profession of educational technology are. Lewis indicates that this type of new conceptual framework is a “lonely and high risk activity.” Kuhn (1962) would consider this new framework a major paradigm change for educational technology and predict the difficulties which will occur in’ its acceptance by educational technologist and non-educational technologist alike. To present the other side of these views of the difficulties associated with this new conceptual framework, we close the definition of educational technology with two positive statements that best summarize what this new definition means and what its implications can be. The educational future will belong to those who can grasp the significance of (educational and) instructional technology (Finn, 1964, p. 26). Various news HOAX are often shared by us, Muslims. Perhaps because happy, because amazed, because it likes. But since we are not careful and critical so that even in disgrace, or bear the sin. Really those who brought forward the lie are a body among You too. Or do you think that false news was bad for you even it is good for you. Each one of them, gets a reply from the sin that he did. And who among those who took the largest portion in broadcasting false news that her great torment (Surah An Nuur, 24:11). May those who like to make hoax, created a bad stigma, and then do a smear campaign to get his guidance, ... then become a useful man in building the Islamic civilization. Aamiin. Technology as product will certainly drive the trends of instructional technology in the future. This will be followed by another dimension of technology that is technology as process or some experts term it psychological technology. Until recently, the development of teaching approaches significantly gives tangible impact in the practices of instructional technology. Later, some experts say that new trend of psychological technology will remain hand in hand in driving the trend of instructional technology. One of important discoveries in psychological technology is accelerated learning. This approach which is founded by psychologist Georgi Lozanov tries to make teaching and learning as relaxing as possible. Through the integration of multimedia such as classic music and attractive visuals, the students are expected to take part in the learning process relaxingly. This is believed to help them master the materials effectively. To make the learning more effective, experts also develop the integration of computer intelligence which is adapted from human intelligence. They call this artificial intelligence. Chess game, for example, is a good example how human brain is adapted in computer game. This will help students train themselves without having ‘real’ partner. This experiment led to the development of another program called expert systems. These are software packages that allow the collective wisdom experts in a given field to be brought to bear on a problem. One of the first such system to be developed is called MYCIN, a program that helps train doctors to make accurate diagnose of infectious diseases on the basis of tests and patient information fed into the computer. Hsieh, I.-L. & O’Neil, H. F. Jr. (2002). Types of feedback in a computer-based collaborative problem solving group task. Computers in Human Behavior, 18(1), 699-715. Miwa, K., & Terai, H. (2012). Impact of two types of partner, peceived or actual, in human-human and human-agent interaction. Computers in Human Behavior, 28, 1286-1297. The goal of multimedia in education and training is to immerse the learner in a multisensory experience to promote learning. By using multimedia, learners can enhance the use of their senses in understanding the lesson. The sound which is found in audio and moving pictures which are found in the video will bring the real experience to the learners. Multimedia makes one’s experience as realistic as possible without actually being there. Multimedia refers to the sequential or simultaneous use of a variety of media formats in a given presentation or self-study program. It makes communication more effective as it combines audio media, visual media, and computers including combinations managed by computers. The maximum use of the senses will enhance the effective communication in the classroom. Communication process based on Berlo theory involves source, message, channel and receiver. Multimedia is the source that sends the message from the media to the students as receivers using the channel. Utilisation of any media, including social media should be carefully considered. It may change new generation’s language habit impacting on the change of the politeness pertinent to particular culture. We argue that youth’s immersion in socila media has influenced their language habit. · The first change is spontanety promoted in socila media brought in within Interpersinal assimmectrical interaction between Student-Lecturer. · The second change is the movement toward the lower context communication style. As a consequence, a politeness is value from formality, absence of the swear word, hurtful words. · The third change is often used of “Bahasa Gaul” that value egalitarianism, modernity,and expression during interaction with lecturer to reduce social distance. · Finally, feeling of connectedness as a result of easy and convinient contact with lectures develops student’s casual choice of language. This notion may also challenge the concept of “traditional” politeness that expected during Student-Lecturer interaction. Due to, the education institution and practitioners should make the police the regulate communication media that is more suitable for the student-lecturer interaction, and incoorporate politeness, broader language etiquette, and culturer ethics in academic curriculum, for mainstrean media, they should be more careful in presenting the model of politeness within broadcasted interaction. Eelen, G. 2001. A Critique of politenss theories. St.Jerome, Manchester. A social network is a social structure made up of a set of social actors (such as individuals or organizations), sets of dyadic ties, and other social interactions between actors. The social network perspective provides a set of methods for analyzing the structure of whole social entities as well as a variety of theories explaining the patterns observed in these structures. The study of these structures uses social network analysis to identify local and global patterns, locate influential entities, and examine network dynamics. Group webpages, blog, wikis, and Twitter allow learners and educators to post thoughts, ideas, and comments on a website in an interactive learning environment. Social networking sites are virtual communities for people interested in a particular subject to communicate by voice, chat, instant message, video conference, or blogs. Computer networks combined with social networking software produces a new medium for social interaction. A relationship over a computerized social networking service can be characterized by context, direction, and strength. The content of a relation refers to the resource that is exchanged. In a computer mediated communication context, social pairs exchange different kinds of information, including sending a data file or a computer program as well as providing emotional support or arranging a meeting. With the rise of electronic commerce, information exchanged may also correspond to exchanges of money, goods or services in the "real" world. Social network analysis methods have become essential to examining these types of computer mediated communication. In practice, as technology has advanced, the particular "narrowly defined" terminological aspect that was initially emphasized by name has blended into the general field of educational technology. Initially, "virtual learning" as narrowly defined in a semantic sense implied entering an environmental simulation within a virtual world. A "virtual education course" refers to any instructional course in which all, or at least a significant portion, is delivered by internet. "Virtual" is used in that broader way to describe a course that is not taught in a classroom face-to-face but through a substitute mode that can conceptually be associated "virtually" with classroom teaching, which means that people do not have to go to the physical classroom to learn. "Nurse education in second life at Glasgow Caledonian University demo". YouTube. Retrieved 2013-10-22. Wasserman, Stanley; Faust, Katherine (1994). "Social Network Analysis in the Social and Behavioral Sciences". Social Network Analysis: Methods and Applications. Cambridge University Press. pp. 1–27. ISBN 9780521387071. · Educational technology as the theory and practice of educational approaches to learning. · educational technology itself as an educational subject; such courses may be called "Computer Studies" or “ information and communication technology (ICT)". Multimedia is content that uses a combination of different content forms such as text, audio, images, animations, video and interactive content. Multimedia contrasts with media that use only rudimentary computer displays such as text-only or traditional forms of printed or hand produced material. Multimedia can be recorded and played, displayed, interacted with or accessed by information content processing devices, such as computerized and electronic devices, but can also be part of a live performance. Multimedia devices are electronic devices used to store and experience multimedia content. Multimedia is distinguished from mixed media in fine art ; by including audio, for example, it has a broader scope. As Oliver (1994) notes, the term multimedia has not always designated computer-based media, as it does now, but originally referred to combinations of audio, visual, and print materials delivered by various media. Now, however, “the term has been adopted by the computer industry and re-defined to mean 'the integration of video, audio, graphics, and data within a single computer workstation. While multimedia applications offer advantages and benefits, these do not come without costs, awareness of which may help users to make informed decisions about the true advantages of the medium (Grabe &Grabe, 1996). The key concerns include unnecessary duplication of existing instructional materials; teachers untrained in design becoming bogged down in the production of low-quality multimedia; problems of assessment using multimedia materials, which occur because learners using hyperlinks in multimedia do not always cover the same material in the same sequence; and high technical demands, with technical difficulties arising because of the complexity of some multimedia applications. 1. reluctance on the part of teachers to see materials transformed. 2. the fear felt by users (staff and learners) over the level of technical knowledge required to get involved. 3. the need of many tutors for special training (which may or may not be conveniently available) to use multimedia effectively. 4. the significant challenge and expense of “adapting and transforming material intended for traditional delivery methods into new media”. 5. the desire to tinker endlessly and mindlessly on presentations, with negative results for productivity. The impact of multimedia in teaching is ultimately dependent upon the incorporation of certain principles that govern its usefulness and effects. Mayer (2001) has suggested seven such principles, based on empirical evidence from his ongoing research on multimedia and actual learning. These principles not only describe the various impacts of multimedia on learning, they also constitute a good basic primer for instructional designers working with media generally. Multimedia principle: Students learn better from words and graphics or pictures than from words alone . Temporal contiguity principle: Students learn better when corresponding words and pictures are presented simultaneously rather than successively. Coherence principle: Students learn better when extraneous words, pictures, and sounds. Modality principle: Students learn better from animation and audible narration than from animation and on-screen text . Redundancy principle: People have only limited capacity to process visual and auditory material presented simultaneously; therefore, students learn better from animation and narration than from a combination of animation, generation, and onscreen text. Individual differences principle: Design effects are stronger for low-knowledge learners than for high-knowledge learners, and for high-spatial-ability learners than for low-spatial-ability learners . Education today is inseparable of technology especially multimedia. With the use of multimedia projects, students can utilise the knowledge presented to them by the teacher, and represent them in a more meaningful way, using different media elements. These media elements can be converted into digital form and modified and customised for the final project. By incorporating digital media elements into the project, the students are able to learn better since they use multiple sensory modalities, which would make them more motivated to pay more attention to the information presented and better retain the information. Grabe, C., & Grabe, M. (1996). Integrating technology for meaningful learning. Toronto: Houghton Mifflin. Helm, P., & McClements, R. (1996). Multimedia business training: The big thing or the next best thing? In J. Frankl & B. O'Reilly (Eds.). 1996EDEN Conference: Lifelong learning, open learning, distance learning(pp. 134-137). Poitiers, France: European Distance Education Network. Oliver, E. L. (1994). Video tools for distance education. In B. Willis (Ed. ), Distance education strategies and tools (pp. 165-173). Englewood Cliffs, NJ: Educational Technology Publications. When we heard the word language, perhaps most of us will think that language is the tools or the symbols which is used for communication with one another. You might have come up with this definition because we know that we used language to communicate with one another. But only a few of us know or study about how the process of the language learning. Some questions are emerged when we talk about how the process of the language learning. Where does the learning take place? How can a person ensure success in language learning? And maybe one of the question which is emerged is ‘What are the strategies does the learner use?' These are some questions which will be answered by the writer in this paper. In order to find the answers of those questions, we must ascertain the core and the fundamental issues to be discussed: defining the focus of our inquiry. Since this paper discuss about Language Skills Learning and learning couldn’t be separated with teaching. So, let’s try to define those two terms first; learning and teaching. Learning and teaching is two terms which cannot be defined apart because we know that learning is the process of getting and acquiring knowledge or new informations consciously by study, experience or instruction (Kimble and Garmezy 1963 : 133). Similary, teaching, which is implied in the first definition of learning maybe define as transferring the knowledge, giving an instruction and guiding in the study of something to the learner. When we learn a language, there are four skills that we need for complete communication. When we learn language, we are generally taught and assessed in terms of the ‘four skills’: listening, speaking, reading, and writing. Listening and reading are known as ‘receptive’ skills while speaking and writing are known as ‘productive’ skills. 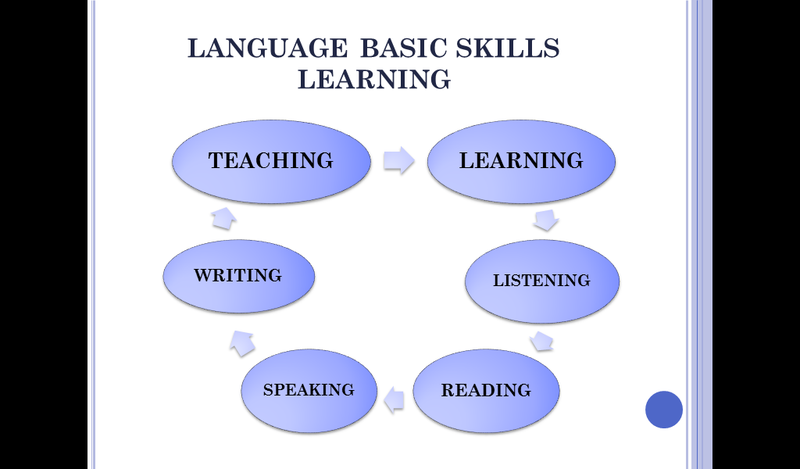 And in the case of being success to learn language, all language learners will need to develop their skills in each of these areas. Not only that, the person’s prior knowledge, attitudes, personality, learning styles, skills and motivation, to mention a few, are all factors related to the eventual outcome of the language study. A further importance for ensuring the learner to be success in learning language is the consciousness of the teacher to find a good teaching style, the classroom techniques and know the principles of teaching. We can say that not only the learner need to develop their skills in each of those four areas but the teachers also need to find their appropriate techniques of teaching the students. As a teacher of language, we must be able to know about our students and how the way they learn. Because as we know a teacher is one of a basic need for a learner. As the writer clarified in the first chapter that teaching activity cannot be apart from learning activity. Following these circumstances, we will roll out some principles of language teaching and learning. In some cases the principles will be expanded so that you can try to put them into practice if you wish. We outline eight principles that apply our best understandings of research on both effective teaching and learning for school-age learners and specific knowledge about how language is most efficiently acquired and best taught. Indeed, the purpose of this paper is to present a variety of principles, some of which may be new to you, and to encourage you to experiment with them. Learners play enjoyable, engaging, active roles in the learning experience. Language and literacy development are facilitated by a comfortable atmosphere—not only one that values, encourages, and celebrates efforts but also one that provides the appropriate level of challenge to motivate and engage learners (Cummins, 2007; Guthrie et al., 2004; Jensen, 1998; Sprenger, 1999; Krashen, 2003). When active engagement is practiced, language is learned while doing something with it, not just learning it. Classrooms respect and incorporate the cultures of learners in the class while helping them to understand the new culture of the community, the school, and the classroom. Teachers play the most important role in determining the quality and quantity of participation of the learners in their classrooms. When teachers develop a climate of trust, understand children’s social and cultural needs, and involving them as a model, can include English learners in classroom conversations and activities as important members of the classroom learning communities, the learners’ active involvement in the classroom and their learning show improvement (Yoon, 2007). Creating a culturally responsive and culturally relevant classroom goes beyond “parental involvement” and requires thoughtfulness and effort on the part of teachers to learn about students’ cultures from students themselves, families, community members, and library and Internet resources; to value and include what learners bring to the classroom from their cultures; and to take into account the different world views represented in the classroom. Learners develop and practice language in collaboration with one another and with teachers. As language is a tool for meaning-making, and communication and thinking are developed through using language to accomplish things (Vygotsky, 1986), and as learning cooperatively has been shown to be effective at improving learning (Kessler, 1991; Slavin, 1995). So instruction should be organized to facilitate interaction and collaboration. Learning should provide two-way experiences through which learners solve problems, negotiate meaning, and demonstrate what they have learned. Learners use a variety of language and learning strategies to expand learning beyond the classroom and to become independent, lifelong learners. Learning strategies (also called learner strategies) (Chamot & O’Malley, 1996; Nunan, 1996; Oxford, 1996; Lessard-Clouston, 1997) are steps taken by learners to enhance their learning and develop their language competence. These strategies can be observable behaviors, steps, or techniques, such as SQ3R (survey, question, read, recite, review) (Robinson, 1970), a reading strategy, or mental practices, such as visualization or positive thinking. Although learners do use strategies unconsciously, the focus in teaching learning strategies is to bring them to the learners’ attention and make them consciously part of the learners’ repertoire. Learning strategies allow learners to control and direct their own learning. These strategies also expand the role of language teachers beyond teaching language to that of helping learners develop their own strategies. They are generally oriented toward solving problems and can involve many aspects of language to be learned beyond the cognitive. Learning activities accommodate different language, cognitive levels and incorporate many dimensions of learning: different learning styles, intelligences. All learners are not the same: they have different native intelligence, learned intelligence, learning styles. Including English learners in a grade-level classroom expands the differences by adding different language backgrounds, educational levels, cultural experiences, experiences of culture change, and sometimes the trauma of war, famine, or poverty. When learners are limited in their comprehension of English, providing input through other means—pictures, gestures, sounds, movement, graphics—helps provide them the “hook” they need to be included in the classroom conversation. Teachers help learners use their prior knowledge of language, content, and the world to develop new language and increase learning. If we already know a lot about a topic—global warming, for example—we will find television programs, lectures, or written materials on global warming much easier to follow. If a student has learned a lot about a topic in his home language, it is easier to develop new language about that topic. Prior knowledge or background knowledge is key to comprehension for all learners (Marzano, Pickering, & Pollock, 2004), but it is of particular importance for English learners. If learners are less familiar with a topic and structures of the oral discussion or written text, they will have more difficulty with comprehension (Upala et al., 2007; Carrell & Eisterhold, 1988). Language difficulty increases with cognitive difficulty, unfamiliarity, and lack of context. So, when developing language with English learners, teachers must work to start where students are. This includes finding out what students already know about a new topic and helping them to make connections between what they already know and what they are learning. It includes making connections between learners’ cultures and cultural knowledge and the new culture of the school and the community. It also may include, at beginning levels, selecting topics that learners are likely to be familiar with, providing necessary background information on new topics in home languages, preteaching key vocabulary to expand background knowledge before studying a topic, or helping learners make connections between what they know about language in their home language (L1) to uses of this knowledge in English (L2). It also might include providing background information in L1 before proceeding to study a theme or topic in L2. In a bilingual classroom, content could be taught in two languages. In a monolingual classroom teachers might, for example, have learners read or listen to a home language summary of a text before they will be reading it in English. Language learning is integrated with meaningful, relevant, and useful content—generally the same academic content and higher-order thinking skills that are appropriate for the age and grade of learners. Teaching language along with age-appropriate academic content has several advantages: it is efficient because two goals—acquisition of language and content learning—are accomplished at once. It is effective first because language is learned better when learners are doing something purposeful and important to them—and learning the content for their grade level is very important. It is also necessary because learners cannot afford to take a year or two off from content learning while they develop language: they will end up only further behind their peers. Content-based language learning can happen in a ­variety of settings: in a pull-out English language development (ELD) class (also called an ESL class), in which the teacher introduces content through integrated themes (this is often used with newcomers/ beginners); in a special section of a content class with a grade-level teacher with training in teaching ELD who teaches the content using approaches that make the content comprehensible to language learners and promote language development (this is sometimes done in middle and high schools with significant numbers of English learners); or in grade-level classes that include both English proficient learners and English language learners and in which teachers have training to attend to both content and language needs of learners and to differentiate instruction to include learners at different language and learning levels. These integrated models are used because research findings have shown that they are the most effective at both language learning and content learning for English learners (Cummins, 1986; Thomas & Collier, 2003). Teachers can differentiate through adapting the language, content, process, or product in classrooms (Tomlinson, 1999). Teachers set and communicate attainable goals for learners and provide students appropriate and consistent feedback on their progress in attaining these goals. Setting clear goals helps both teachers and learners have a much greater chance to attain those goals. Goals begin our curriculum, inform our curriculum, and new, more advanced goals are the outcome of our curriculum. As John Dewey once said, “Arriving at one goal is the starting point to another.” We want English learners to attain the same high goals as their English-proficient peers, but to do this, we must set the right goals—goals that comprise the next step forward for individual learners. Learners want to do well, and will do much better when they understand what is expected of them and when our expectations are appropriate. We must establish clear language and content goals for learners and provide them feedback on their progress toward those goals. We can also, in developmentally appropriate ways, encourage learners to begin to evaluate their own progress toward accomplishing goals to help them become independent, self-motivated learners. We must determine intermediary steps toward grade-level standards that are attainable at learners’ language level. Aebersold, Jo Ann and Field, Mary Lee. 1997. From reader to reading teacher. : issues and strategies for second language classrooms. Cambridge University Press Retrieved from http://www.scribd.com/doc/139. Brown, H. D. (2000). Principles of language learning and teaching (4th ed.). New York: Longman. Retrieved from http://aeservices.net/English/Language-Learning-Mitsutomi. Krashen, Stephen. 1982. Principles and Practice in Second Language Acquisition. Oxford: Pergamon Press. Retrieved from https://pedufopenglish.files.wordpress.com/2014/06/teaching-by-principles-douglas-brown. Van Lier, L. (1996). Interaction in the language classroom. London: Longman. Retrieved from http://aeservices.net/English/Language-Learning-Mitsutomi.